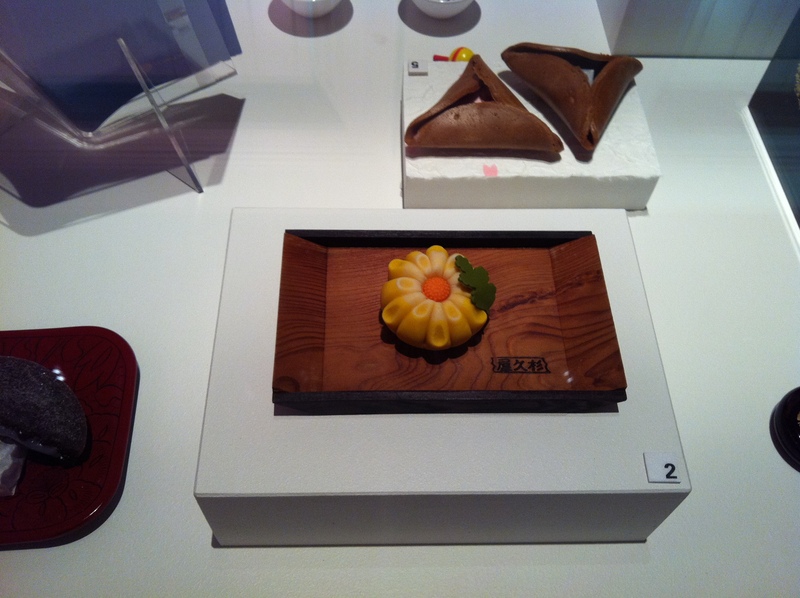 About a month ago, I saw a bunch of blog entries about the new exhibition Sweets: tastes and traditions from many cultures at the Immigration Museum in Melbourne. I entered a competition to win tickets to attend the Sweets Festival (part of the Melbourne Food and Wine Festival) with no hope of actually winning anything. Honestly, the best thing I’ve won in my life was a Bart Simpson skateboard off a jar of Nutella when I was young. Imagine my surprise then, when I saw that I had won tickets from Ms I-Hua (and receive a recipe book of sweets from different cultures!). I was pumped! Mum and I set off for the Immigration Museum on festival day (18/3/12) not really knowing what to expect. Imagine our surprise, then, when the queue to get in stretched almost to the end of the block – this Sweets festival was proving more popular than we thought! 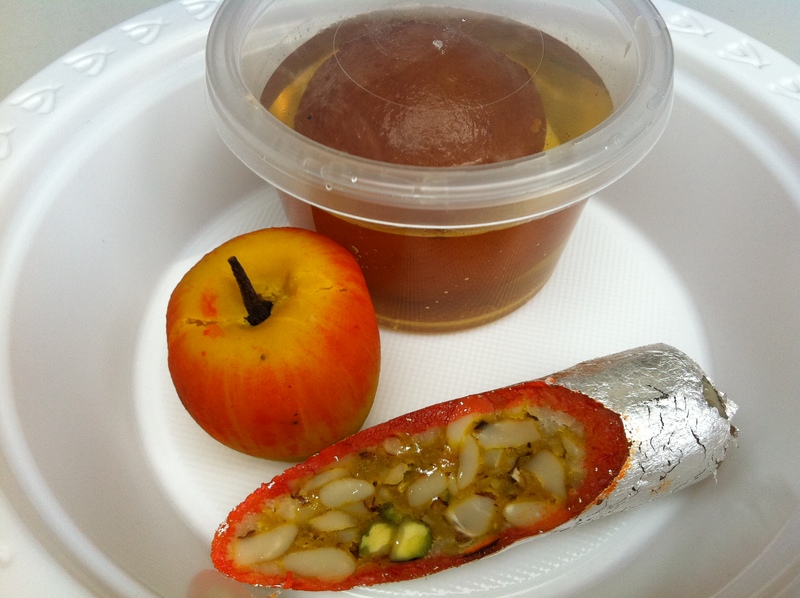 The festival included a wide range of food stalls, selling both sweet and savoury snacks. As soon as we got in, we had to console ourselves with a revivifying Turkish coffee and Italian cannoli (pistachios and lemon ricotta on the inside). 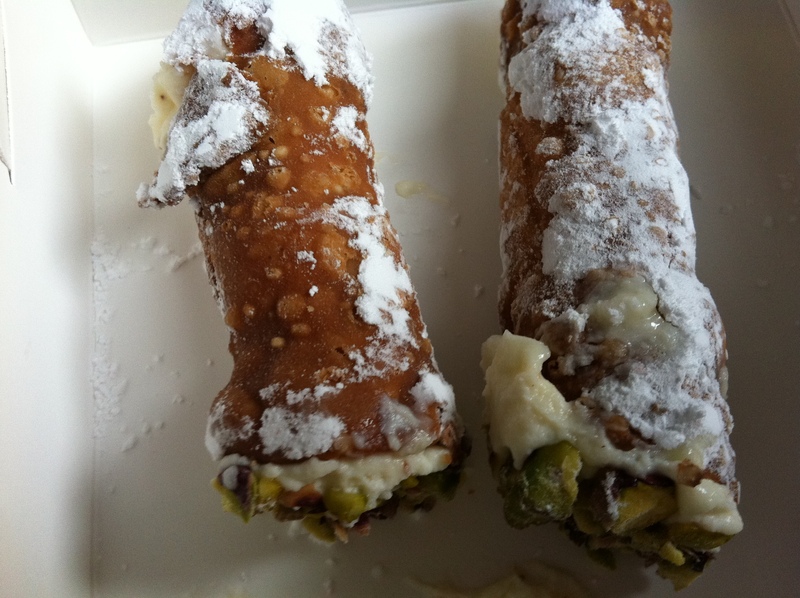 The cannoli were delicious – that interplay of crunchy and soft textures is always a winner in my book! We watched Indian dancing on the main stage as we ate the cannoli. 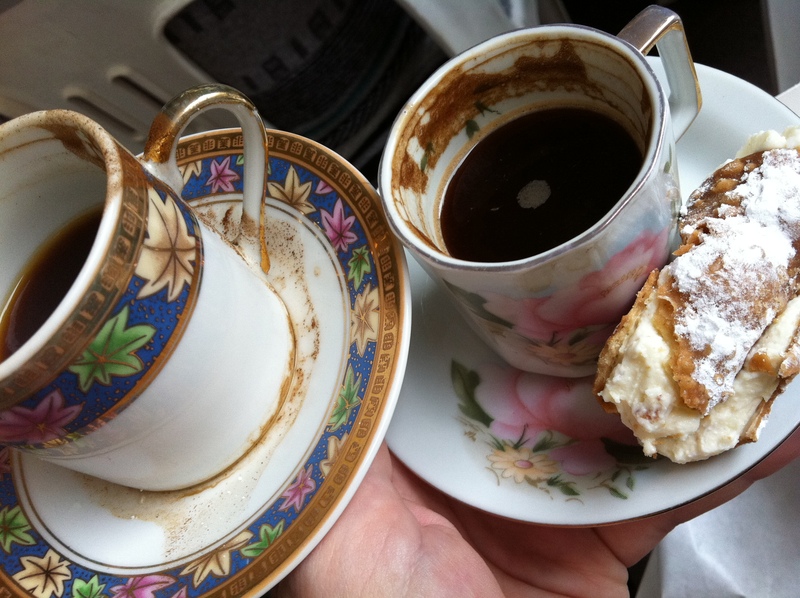 The Turkish coffee came in gorgeous little china cups and saucers, and was bracing! Our next stop was the Indian sweets stall. I’d had a lot of these in India on my trip there two years ago for a wedding, but Mum was keen to try them. I am not sure of their correct names – I was calling them barfi and laddu when in India, but these may refer to a certain type of Indian sweet rather than the whole lot (comment if you’re more informed than I am, please!). Doesn’t the little apple type sweet look amazing though! The stalk is a clove. I preferred this one, while Mum liked the fancy barfi with the edible silver paper. 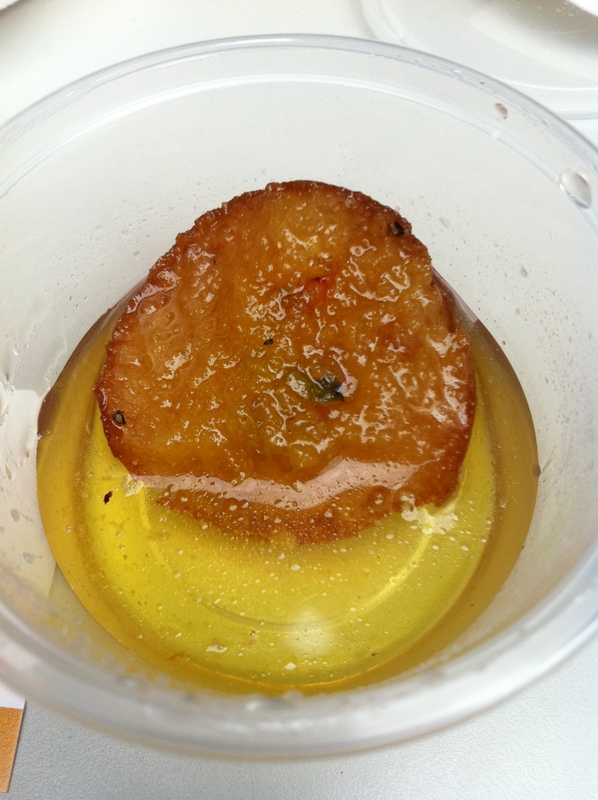 This gulab jamun was a little fancier than some others I’ve had which were plain milk powder balls. It had spices and chopped pistachios incorporated into the mix and was a lot more interesting for it. The sugar syrup was as overpowering as it always is, however. And that’s not a bad thing at all! After all that sweetness we needed a palate cleanser badly. We scoffed down a shared samosa (not pictured) and seated ourselves for one of the mini talks that was going on at the festival. Helva, halva, halwa was an exploration of how three different cultures, Mauritian, Indian and Turkish, all have similar yet different variants on the dessert/sweet called halva. Scratching one's heads at the similarities between cuisines, or just a poorly timed photo? You decide! 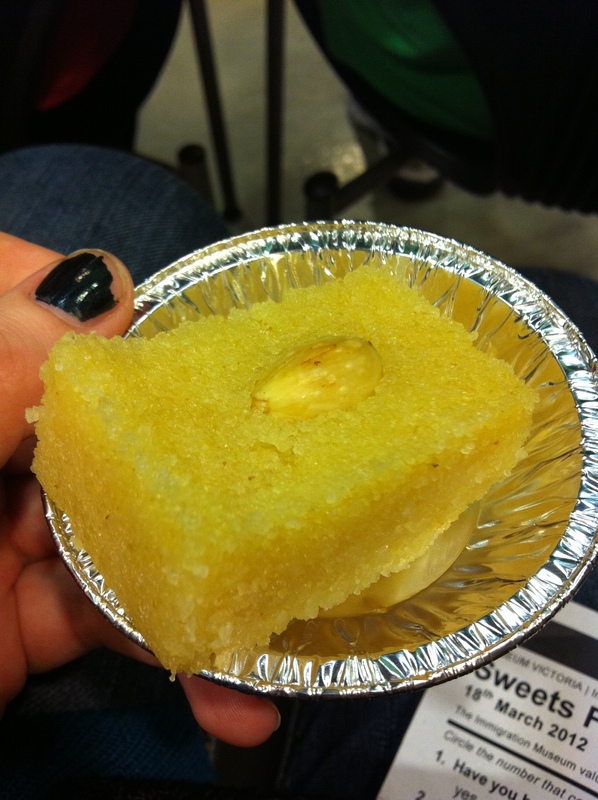 The Indian and Turkish variants of halva demonstrated used semolina as the base, while the Mauritian version used chopped almonds and cashews as well as grated carrot and sultanas. (I actually preferred the Mauritian halva of the ones I got to try, but I know there’s a similar Indian version that uses carrot because I had it in India.) The Turkish demonstrator (unfortunately I’ve managed to miss her out of the picture above) actually cooked an entire serve of halva for the audience during the demonstration! Please excuse the chipped black nail polish and focus on the Turkish halva if you will. 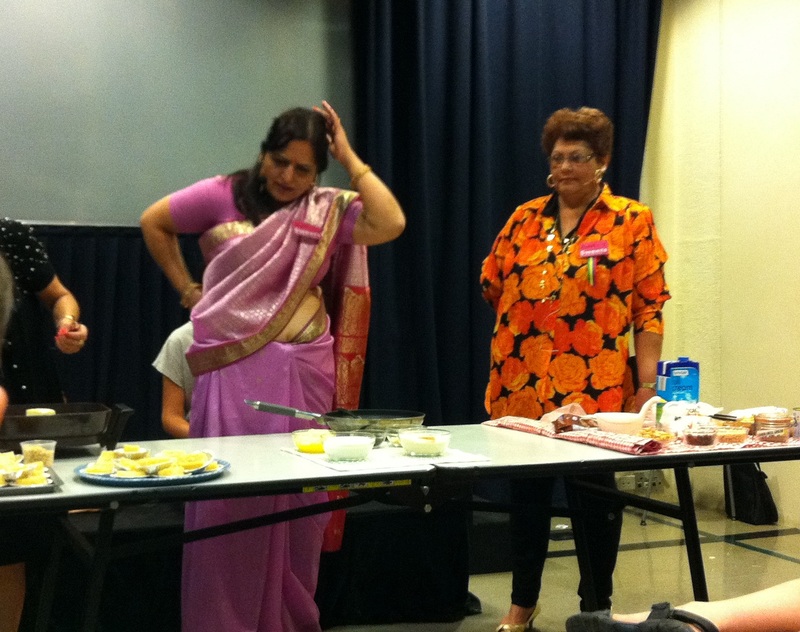 The talk was a great success with all three women raising a laugh from the audience, particularly Jacqui from the Mauritian community who kept insisting that halva was “healthy” if you used skim sweetened condensed milk (even as you poured cups of sugar and ghee into the mix!). 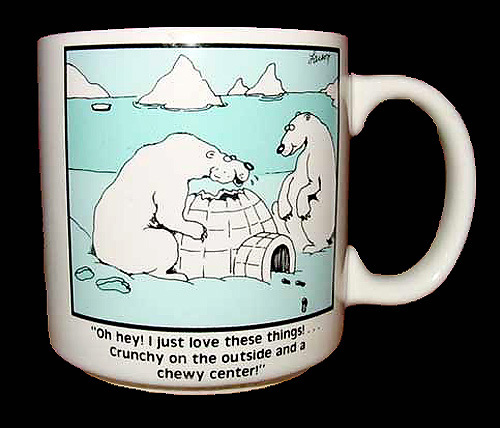 I also enjoyed hearing the three women’s stories about when and where halva is eaten. In Turkey, apparently, it is cooked often as part of a funeral process where the women of the family gather and make halva while reminiscing about the person whose life has passed. However in India it is often made for celebrations such as birthdays and weddings as well. At this point we were dying for some savoury food so we took a break from wandering around the museum and made a beeline for the gozlemes stall. This was run by a Turkish family who were doing it to help charity, not as part of any market stall or business. How nice is that? In fact, I think a lot of the stallholders at the festival were there for charity. 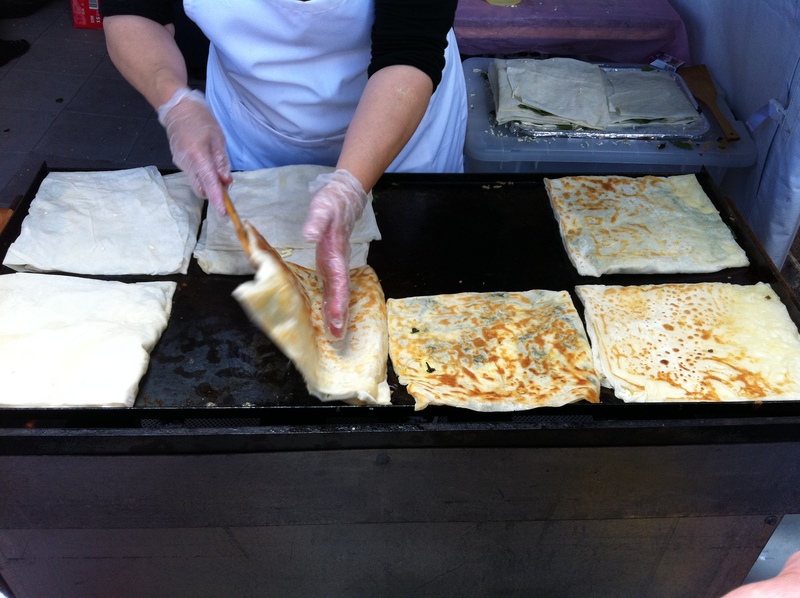 I’ve seen gozlemes at many a festival and never tried them before now, fearing that I would still be hungry afterwards. Not an issue when you’ve eaten the quantum of sweets we had beforehand. 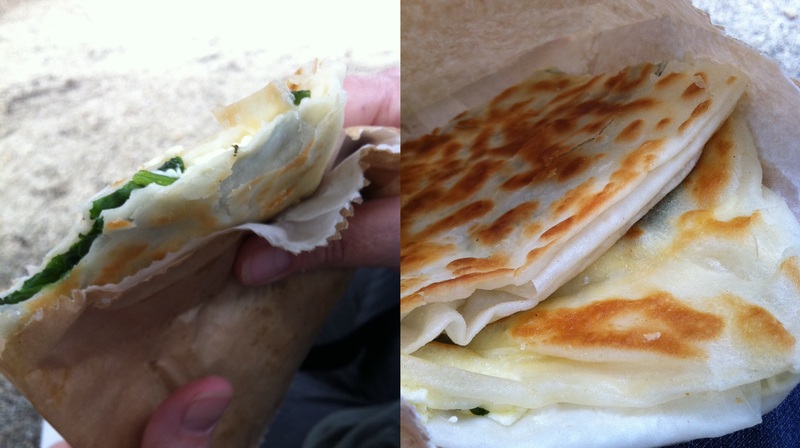 Mum and I shared a gozleme: the salty cheese was terrific, pastry flaky (no doubt due to the copious amounts of oil applied) and the spinach makes it seem “healthy”. Brilliant lunch! Flipping the gozlemes, production line in action. 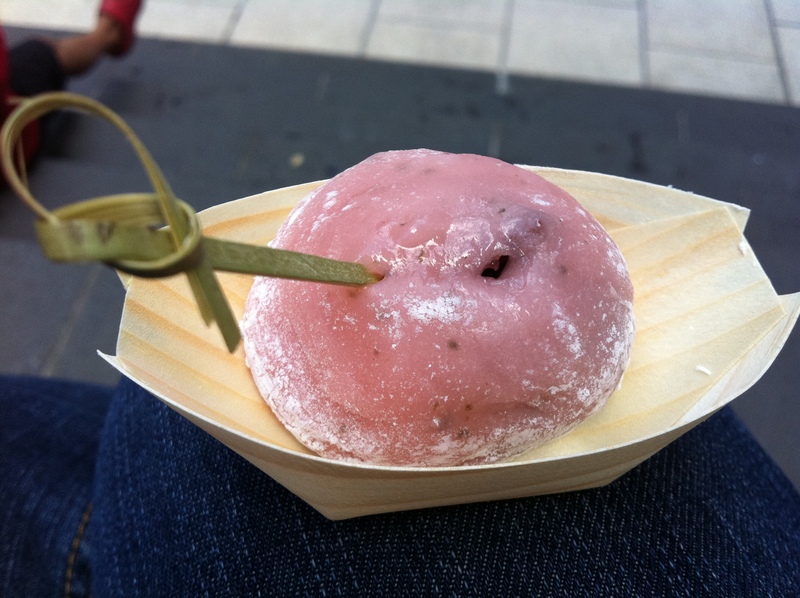 Japanese sweets are gorgeous, aren’t they? 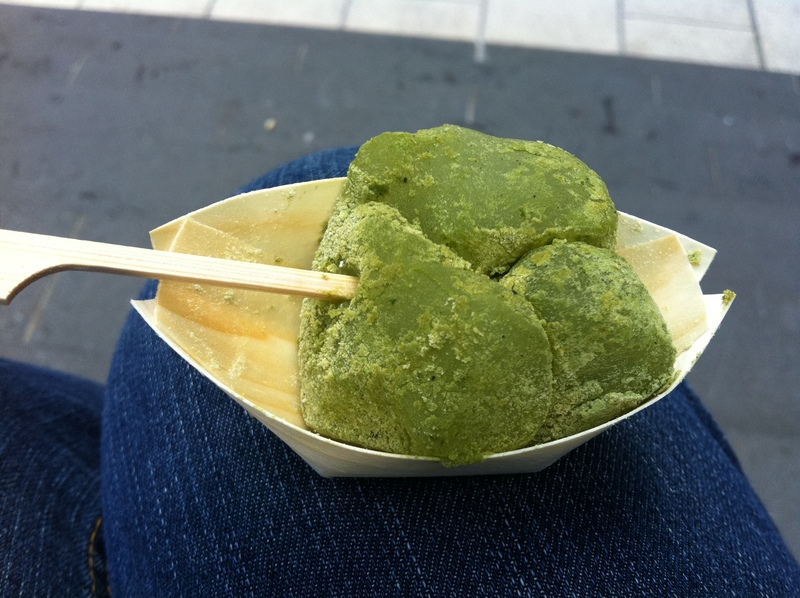 We also tried green tea variants of this. I used to find Asian sweets (way to generalise an entire continent) a bit so-so, ho-hum… but after all of the insane sweetness of the halva, I welcomed the more moderate and nuanced flavours of these Japanese creations. To wind up this long winded post (we were at the festival for hours though! 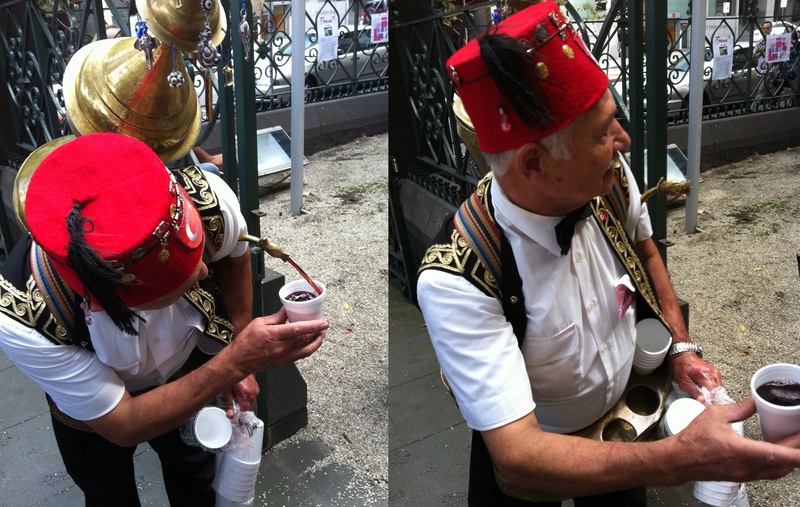 ), this guy was wandering around serving free cherry cordial (nicer than it sounds – not too sweet and was real cherry juice flavoured, not fake cherry) out of the huge samovar type thing on his back. What a cool job. Wandering around dispensing cherry love. I assume he was one of the Turkish representatives. He drew quite a crowd of excited kids (and twenty something kids and their mums). All in all Mum and I had a brilliant time at the festival and I’d like to thank Ms I-Hua and the other bloggers for publicising it beforehand. Other than reading in The Age on the day, I didn’t see much of the festival mentioned elsewhere, and I would never have thought to go. It’s through reading food blogs that I discover a lot of great places to check out and once again, the power of this medium to attract and get people excited about these sorts of events is very cool. Oh, and I haven’t wanted to eat anything sweet for at least a week. Tags: cultures, immigration museum, indian, italian, japanese, mauritian, sweets, turkish. Bookmark the permalink. Love your blogs – can imagine I was there with you and always learn something! !